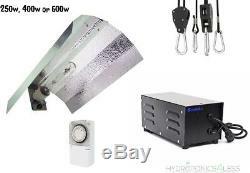 Hydroponic Tent Grow Light Kit Ballast Euro Reflector System HPS 250w 400w 600w. Please Choose Above Which Size You Require. A simple Dutch barn style reflector. It is open-ended, highly polished and dimpled lightweight reflector, which gives an efficient and even distribution of light. Sodium HPS offers exceptionally high output. Couple this with raised spectral discharge in the reds and blues (exactly the right spectral energy distribution curves that your plants need to thrive) and a long lamp life, and you have the perfect plant grow light. This lamp also has 32,000 life hours and colour temperature of 2000K. Spectral output changes in a HPS lamp as it ages. We recommend changing your lamp every 9-12 months for optimum growth conditions. Ballast enclosures are made from heavy gauge steel and are powder coated to ensure a hard wearing finish. Thoroughly tested to ensure each product is in full working order and is electrically safe. 24 hour plug and play timer. Will control up to 13 amps. Can be set to switch from 15 minute intervals. The item "Hydroponic Tent Grow Light Kit Ballast Euro Reflector System HPS 250w 400w 600w" is in sale since Thursday, December 4, 2014. This item is in the category "Garden & Patio\Hydroponics & Seed Starting\Grow Light Kits".